CAIRO — A commercial dispute between Mohammed Salah and football authorities in his native Egypt has been swiftly resolved following top-level political intervention, a quick turnaround that showcased the mega star power of the 25-year-old Liverpool winger. Salah had been upset that his image is featured prominently on the outside of the national team's plane, which was provided by official team sponsor WE. Salah has a sponsorship deal with a rival telecommunications firm, Vodafone. Youth and Sports Minister Khaled Abdel-Aziz summoned the board members of the Egyptian Football Association for urgent talks on Sunday. Abdel-Aziz said late Sunday that he and the association have agreed to meet Salah's demands. "I assure everyone that we will stand by him to honor all the contracts he entered in England," Abdel-Aziz wrote on Twitter. In comments later made to a popular television show, he said: "Consider that all the demands made by them (Salah and his agent) are met." Farag Amer, head of parliament's Youth and Sports committee, told a television show late Sunday that President Abdel-Fattah el-Sissi was behind the order that the dispute be quickly resolved. The dispute erupted six weeks before Salah leads Egypt at the World Cup, the country's first appearance at the tournament since 1990. It also comes ahead of Wednesday's match between Liverpool and Roma in the second leg of the Champions League semifinals, with the English team leading 5-2 from the first leg. Salah scored two goals and assisted another two at Anfield. At the World Cup, Egypt will play in Group A against host Russia, Saudi Arabia and Uruguay. Abdel-Aziz also appeared to acknowledge that the federation was to blame for the dispute with Salah, saying it was likely that it did not have the expertise to deal with commercial issues relating to a player of his global status. The association confirmed Abdel-Aziz's assertion that a resolution has been reached. It tweeted that chairman Hany Abou Rida told Salah on the phone: "Anything that annoyed you will stop. What is more important to me is that you and your teammates are relaxed so that you hold our heads high in the World Cup." A tweet by Salah earlier on Sunday showed his frustration. Ramy Abbas, Salah's agent, claimed separately that the federation had ignored his requests for clarifications over the issue. That triggered a massive outpouring of support on social media networks for the player. Abbas argued that the federation and its sponsor, local advertising agency Presentation, had no right to use Salah's image without written consent from MS Commercial, Cayman, the company that owns Salah's image rights. No sportsman in Egypt has ever commanded the adulation and respect Salah has enjoyed since joining Liverpool last year from Italian club Roma. With more than 40 goals this season, Salah has captivated the soccer crazy nation of about 100 million people. Hardly a day goes by without Salah on the front pages of Egyptian newspapers. He has sent Egyptians streaming to street cafes to watch him play for Liverpool and weaning them off their passion for Lionel Messi and Cristiano Ronaldo. To most Egyptians, he brings them happiness and pride at a time of great economic difficulties. "I want to thank everyone for your support today," Salah tweeted late Sunday. "In fact, your response was extraordinary and your interaction made me very happy." 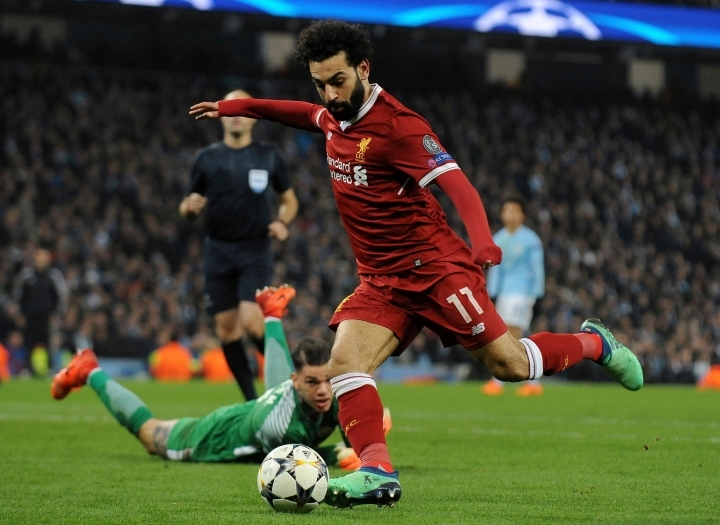 The Arabic hashtag "I support Mohammed Salah" was widely used online, with hundreds of thousands of fans declaring their unwavering support for the player against the federation. Many of the tweets touched on politics, making references to widespread corruption and inefficiency. When news of the resolution of the dispute broke, Salah humorously tweeted he was sorry to see "I support Mohammed Salah" hashtag go. "Never mind about Twitter and focus on the next match (in Rome)," Egyptian comedian Mohamed Henedy tweeted in response, "and I promise you we will create a whole new Twitter for you, not just a hashtag."